Did you know that we lose most of the vitamins while cooking food? It is important to eat healthy food. No one wants to be sick because of food. You must be using pressure cooker for easier meals. Even if you are not, then think about shifting to pressure cooker. 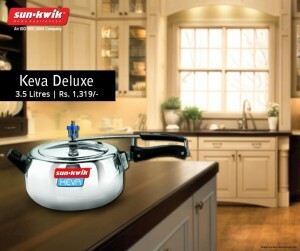 Buy pressure cooker online or visit the local stores, and get the desired one. In this post, we have discussed some useful tips on how to cook food without losing the vitamins and minerals in it. Due to lack of time, most families have taken the fastest way out. Cooking on a high flame is unhealthy, because most of the food nutrients are lost. As far as possible, try to cook over a medium or low flame. Keep the oil and spices minimum, as too much of oil and spices destroy nutrients in your food. If you are steeping the veggies & fruits in the hot or warm water, it destroys the nutrients. As an alternative, you can soak them in cold water or normal tap water with some added salt. You cannot eat few vegetables without peeling the outer skin. But, in some cases, the peel is also very healthful. While cooking, keep the peel of the vegetables and fruits. Try to close the lids if you are cooking in a pan. Covered cooking maintains the vitamins & minerals of the foodstuff. Before cooking rice, soak in warm water for 15 minutes or more. Rice can be cooked on high flame or in a pressure cooker. If you are cooking rice in a pressure cooker, wait for one whistle, and then decrease the flame. Your food will be more nutritious.